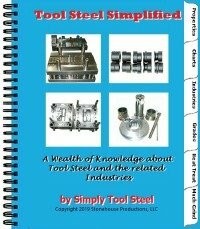 Tool steel doesn’t offer the end user much benefit in the plate or bar form. Tool steels must be fabricated into the desired shape before they are able to be used. Fabrication is achieved with various methods of machining. The goal of machining tool steel is to produce a tool of the proper shape and the proper dimensions. The tool should also have a smooth surface and a balanced geometry, if possible. Avoid tearing of the surface, as a rough surface finish can lead to initiation of a crack. For more information see Avoiding Tool Failure. Tool steel is usually provided to the machinist in the annealed or soft condition. Steel mills provide the tool steel in the annealed condition so that the machinist can readily machine the tool steel into a useable tool. The typical annealed hardness for each grade can be found on the specific Data Sheets.